Those gathered outside the Cathedral Church of St. Nicholas in Newcastle upon Tyne heard the approaching naval parade well before they saw it. 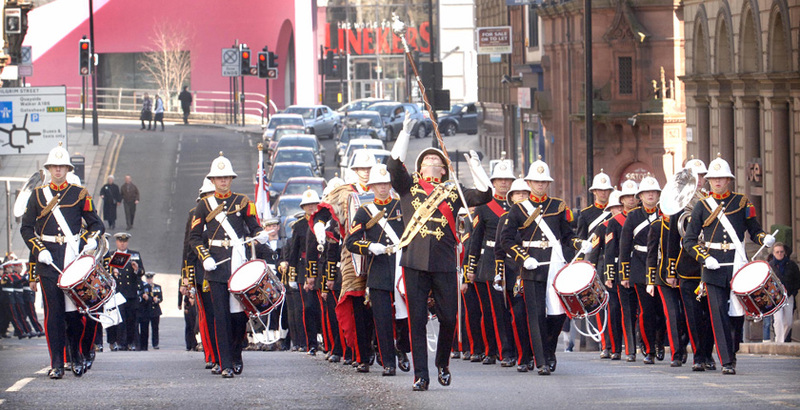 Led by the Band of the Royal Marines (Plymouth) and containing contingents from HMS Cumberland, HMS Collingwood, HMSCalliope, HM RMR Tyne, the Combined Cadet Force Unit of the Royal Grammar School Newcastle and local Sea Cadets, it had formed up at the Civic Centre and marched through the City Centre before sweeping down Grey Street and swinging into Mosley Street, cresting the hill outside the Cathedral where the Lord Lieutenant of Tyne and Wear. Mr. Nigel Sherlock, DL FRSA, the First Sea Lord, Sir Mark Stanhope, KCB, OBE, ADC and the Lord Mayor of Newcastle, Cllr Mike Cookson were waiting on the saluting dais. It was then the turn of the Cathedral Church itself and the 1805 Club to host the major Service of Commemoration. In his opening remarks, the Dean of Newcastle, the Very Reverend Christopher Dalliston created immediate interest by explaining that the thoughts and prayers in the service were being shared at this time with the Anglican churches in Collingwood, New Zealand; Collingwood, Ontario and Port Mahon, Menorca. 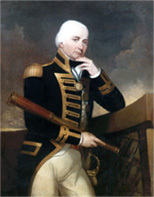 He then went on to list Collingwood’s attributes as a family man, as a diplomat, as a peace-keeper and as a compassionate humanitarian, giving them equal billing to his historical reputation as a naval officer and battle commander, thereby striking a number of chords in today’s times. Several of these attributes were illustrated in extracts from letters both written by and about Collingwood, read by members of the Collingwood family. Sir Mark Stanhope, in his address, spoke of the significance of the legacy left by Collingwood to today’s Royal Navy. Both the Cathedral choir and that of the Royal Grammar School contributed to the service. 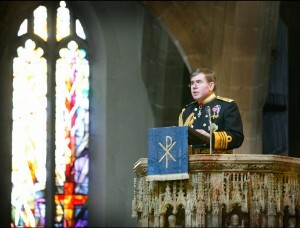 The service ended with a wreath laying ceremony at the bust of the Admiral in the Cathedral. Although it was the Lord Lieutenant, the First Sea Lord and the Lord Mayor who jointly laid the tribute, a young Sea Cadet had been chosen to bear the wreath through the congregation to the ceremony, thereby mirroring the age at which Collingwood himself had been sent to sea. Click here to see and download the full Order of Service from the Newcastle Commemoration. 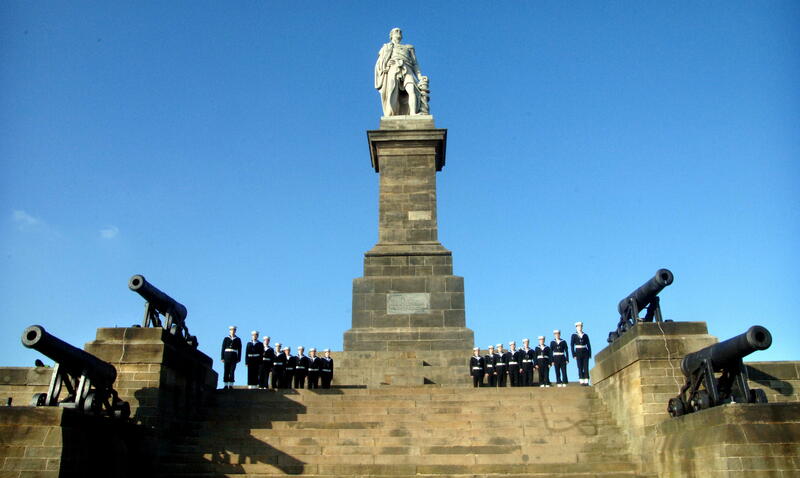 Then it was a dash out to Tynemouth and the turn of North Tyneside to stage an event at Admiral Collingwood’s statue on the high ground overlooking the entrance to the river Tyne. Promptly at 3.00pm and catching both onlookers and seabirds by surprise, pyrotechnics laid directly under the four Royal Sovereign cannons exploded into life, signalling the start of proceeedings here. A shorter service was conducted by the Reverend Geoff Lowson of Tynemouth Priory, Holy Savior to an assembled congregation in a large marquee adjacent to the monument and this was relayed through loud-speakers to a crowd of several thousand who had gathered to witness proceedings. Children from Collingwood Primary School, North Shields, contributed this time and the Wallsend Salvation Army Band added instrumental support. Reverend Lowson was under strict orders to not exceed 22 minutes for his service and, to his credit, the wreath laying party for this service moved to the memorial exactly on time, where tributes were laid by the Lord Lieutenant as representative of her Majesty the Queen, The First Sea Lord for the Royal Navy, Mr Nicholas du Sautoy for the Collingwood family and Linda Arkley, Elected Mayor of North Tyneside for the Borough. At this point, the reason for the strict timescale became evident as HMS Cumberland, which had been making her way steadily down river, her outline masking the low Winter sun, was by now abeam of North Shields Fish Quay and commenced firing her 19-gun salute in recognition of the presence of the Navy’s most senior officer. This was returned by guns from 101 (Northumbrian) Regt Royal Artillery (V), positioned directly adjacent to Collingwood’s monument, the steps of which had been dressed for the occasion by a contingent of naval ratings. 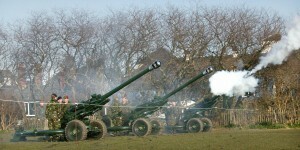 The cannons at the Collingwood Monument in Tynemouth saw action at the historic Battle of Trafalgar and this ‘firing’ was the first time they had been used in more than 100 years. The four huge guns were on board Collingwood’s ship the Royal Sovereign when it led the British fleet into action at the battle in 1805. This form of salute dates back to the days of sail and muzzle-loading cannon, when visiting ships would ’empty’ their guns as an indication of their peaceful intentions. Shore batteries would return the ‘salute’ thereby indicating an assurance of safe passage for the ship. The presence of HMS Cumberland and exchange of gun-salute on the Tyne in the shadow of the Collingwood Monument formed a moving and spectacular event to commemorate Collingwood’s death at sea 200 years ago. 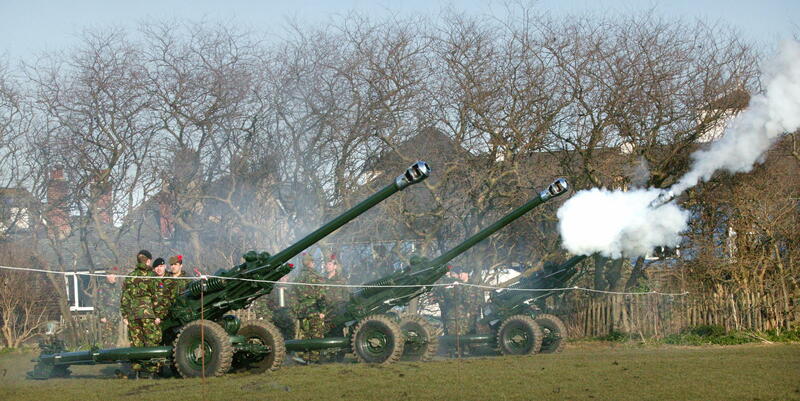 It is not known exactly when the Royal Sovereign’s cannons were last fired, but it is certainly not in living memory. Today’s ceremony presented a unique opportunity to hear how they might have sounded at Trafalgar and to experience at close hand the exchange of gun salutes with HMSCumberland as it left the Tyne. HMS Cumberland, at 5,300 tonnes and 148 metres in length, belongs to the highly-successful Type 22 Broadsword class of frigates which now rank as some of the most powerful surface combatants in Royal Navy service today. The 6.00pm service at Christ Church, Preston Road, North Shields also remembered their connection with the Collingwood family and marked the anniversary of the Admiral’s death with a special ringing of their church bells from 5.30pm. (Christ Church has a number of connections with the Collingwood family: one of their residences, Chirton House, lay close by and they would have attended the Church. Lady Sarah Collingwood lived with her daughters Sarah and Mary at Chirton after the Admiral’s death. The Revd. Christopher Reed, vicar of Christ Church for 38 years, married Admiral Collingwood’s neice, Ann. A number of family members, including the Admiral’s brother John, are buried in the family vault). An evening of traditional and sea songs in the “Collingwood Arms”, Brandling Village, Jesmond, Newcastle upon Tyne, featuring regular musicians “Strings Attached” closed a very full day on Tyneside where the name of Collingwood was on many a Geordie’s and many a visitor’s lips…..